In a highly successful campaign where “the camera tastes food before the mouth does”, Johnson & Johnson China focuses on young Chinese consumers’ love of taking pictures of their meals and sharing on social media networks to remind them to pay attention to oral health at “foodie time.” The small budget campaign was 720 times more cost-effective than the average CPM of TV in China tier one cities. Here’s how it works: The office gang was about to start dinner at their favorite hangout, Mr. Shi’s, when Janet aimed her smartphone at the plates in front of her snapping a picture of the steamed dumplings, beer-marinated chicken and the lamb and vegetable dishes. 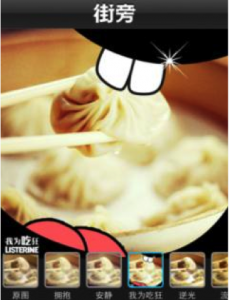 Before checking in and sharing her photos with her friends on China’s most popular LBS app, Jiepang, she decorated her pictures with cartoon lips and teeth that neatly framed the photo and identified her as a “foodie”. In the corner of the photo frame was a small Listerine logo with text: “I’m crazy about food”. Use of the photo frame earned the user a discount on the new Listerine Green Tea flavor mouthwash at local retailers. Johnson & Johnson is clearly aware of the need to connect with the consumer on the consumer’s terms, both online and off, making marketing a natural part of the message and making that message come alive as part of the user experience. It seems that companies like Johnson & Johnson are enjoying a vast market in China where mouthwash is not a typical part of daily oral hygiene. Though only costing $60,000, the highly successful “Camera Tastes the Food Before the Mouth Does” campaign gained 2.54 million media impressions, increased sales 23% and was nominated for “Best Small Budget Marketing Campaign” by Asian Marketing Effectiveness 2013. Similarly, Neutrogena’s “I Love Sunshine” campaign relies on Jiepang’s open API to create smart photo filters that users can apply to their photos, adding sun ray photo effects according to the time of day, location, temperature and timestamp of the photo along with a UV rating. Users of the photo filter earn a branded virtual badge with special code that can be redeemed for a discount on Neutrogena purchases both on- and offline. Checking in by itself is only part of the story. But when typically activities like taking a picture are augmented with Jiepang’s smart photo filters or their newest activity tags such as “exercise”, “work”, “food”, or “travel” people are sharing more about themselves – the who and what, not just the where of their lives. This provides more common points of connection between users on- and offline and gives global brand partners like Johnson & Johnson, Starbucks, Volkswagen and others more meaningful ways to reach consumers.